Lightly sparkling Big Easy Iced Tea & Lemonade is at the forefront of international beverage industry trends, claims Chill Beverages’ marketing director, Ross Hobbs. “Making its debut in the carbonated soft drinks category, the biggest beverage category in the world, new Big Easy Iced Tea & Lemonade ticks all the right boxes in terms of what consumers want,” says Ross, who hopes this new hybrid will amount to transformative change for the CSD market. “Ernie’s Big Easy is a laid-back drink that brings you the big taste of lemonade and the easy refreshment of an iced tea,” adds Hobbs. Chill Beverages International supports Els for Autism, the NGO founded by Ernie and Liezl Els to help autistic children. Sales of new Big Easy Iced Tea & Lemonade will contribute towards this initiative. “Getting involved in the beverage industry by partnering in this South African product innovation is an exciting business challenge for me. My partners, Chill Beverages, located in Stellenbosch, were a natural choice after having already established my wine estate and restaurant in this special town over the last decade or so,” says Ernie Els. Available in three flavours, Original Lemon, Cranberry, and Peach, gently sparkling Big Easy Iced Tea & Lemonade is a refreshing thirst quencher for the whole family. At its best served cold with a slice of lemon and ice, Big Easy also works well as a mixer. Try Original Lemon with a dash of bourbon whiskey, the Cranberry with vodka or for a new spin on the famous Bellini, blend the Peach with a lively Cap Classique or sparkling wine. 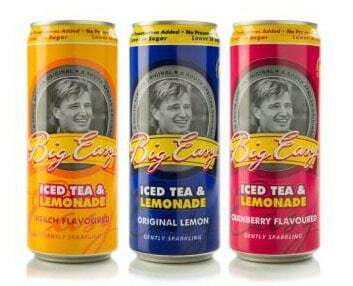 New Big Easy Iced Tea & Lemonade comes in the new elegant 330ml slender can boldly depicting Ernie Els with a different bright colour differentiating each of the three variants. It has impactful on-shelf appeal and is available in a pack configuration of 4 X 6 X 330ml trays. With a recommended RSP of R8.50 per can, this new iced tea innovation has already secured impressive listings in leading on and off-con outlets.